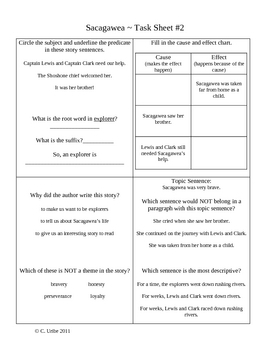 This is a set of 4 activity sheets to go with the Houghton MifflinÂ® 3rd Grade Reader's Library story "Sacagawea". These are great minilessons or spiral review activities for the whole class, small cooperative groups, independent seatwork, universal access, or ELD! 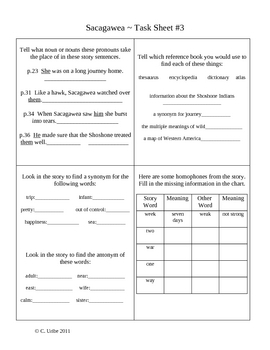 Skills covered include: syllables, punctuation/quotation marks, fact/opinion, ABC order, guide words, genre, parts of speech, subject/predicate, cause/effect, writing skills, synonyms/antonyms, homophones, multiple meaning words, personal connections, theme, author's purpose, singular/plural, generalizations/details, possessives, suffixes, reference books, proper nouns, and pronouns.